Rohan’s influences stem from the people and places that shaped his life. He was born in Sydney, Australia in 1977, the son of two professional artists. In addition to his parent’s creative influences, his grandfather was a Professor and well-published Chinese historian who also collected Ming Dynasty furniture. Growing up, Rohan spent his summers on the rugged beaches of Australia’s Eastern coastline in his family’s home surrounded by the dense Australian bush. His exposure to driftwood filled beaches, complex landscapes of Australian hardwoods, as well as his travels throughout Europe and Asia, helped shape his approach to furniture design and construction today. Rohan received formal training from Australian National University’s Canberra School of Art where he studied Woodworking & Furniture Design from 1995 to 1999. At university, Rohan studied under the late George Ingham, a Master Craftsman and prominent figurehead within the Australian visual arts and crafts community. After graduating with First Class honors, Rohan began his own custom furniture business in Australia’s capital of Canberra. Rohan and his wife relocated to her hometown of Chicago in 2006, where he spent four years managing Bernacki & Fil Workshops, a Chicago-based custom furniture business creating high-end furniture, built-ins, cabinetry and home theatres for top interior designers around the Midwest. 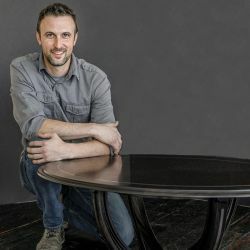 The launch of Rohan Ward Designs LLC marks the culmination of years of practical experience, technical training, and a relentless passion for creating beautiful furniture from wood. Rohan currently resides in the suburbs of Chicago with his wife and two young sons.